“For Better or For Worse”. I remember speaking those words to my husband-to-be on our wedding day. And I remember him saying those same words back to me. We weren’t merely repeating the words as the preacher prompted us. We both truly meant those vows to each other & to God. Those who know us say that we’re like newlyweds even though we’ve been married for many years. And it’s true, his brown eyes still make my heart flutter. But although It’s fun to be that cute couple at the church picnic who like to hold hands and always enjoy being together, it’s that ‘For Better or For Worse, In Sickness and In Health’ part that defines a true soulmate. How blessed I am to have him in my life! RancherMan was beside me at every diagnostic appointment, procedure & surgery as well as each & every follow-up visit with the many specialists afterward. He told me one of his jobs was to hold my hand, and hold my hand he did! You see, I’m just a *little* needle-shy. But his hand was firmly grasping mine at each of those many episodes this year, calming and comforting me as only he can. When the main surgery was over & the long recuperation began, that’s when he really began to shine. He was solely responsible for running the ranch by himself while I was out of commission. What a huge task! And yet never once a complaint from him. Plus he was the most amazing, tender, unselfish caregiver I could have ever imagined. He made sure I was comfortable. And he made sure my prescriptions were filled and that I took them on time. It was he who made sure I ate right and slept as comfortably as I could. He kept detailed records during my recovery for follow-up visits and he handled each & every insurance issue one-by-one as they came in. He told me I had enough to worry with, I shouldn’t be worrying with insurance. (smile) I never had to ask for anything large or small, my needs were all met before I could ever ask! Actually, it was at his insistence that I start this little blog of mine. He said it would help distract me, and give me a creative outlet while my body healed. Oh how I <3 him!! If there’s a silver lining to all of this (and there IS) it’s that this terrible year has drawn us even closer. I have so much admiration for his strength and love. And I appreciate him in ways I could have never imagined had I not gone through this. His eyes still sparkle when he looks at me. And with it’s with sincere love & devotion in his voice when he tells me it’s all been worth it because I’m still here with him. Thankfully, we’ve gotten one of the baddest of the bad ‘Or Worse’ times out of our way and we’re looking forward to many more ‘For Better’ days ahead… TOGETHER! October is National Breast Cancer Awareness month. I used to shrug off all the ‘pink’ that shows up this time of year with all the breast cancer fundraisers, etc. But it’s personal now. Ladies, do those self exams & get your mammograms. Protect your life because yes, even without a family history of breast cancer it CAN happen to you! 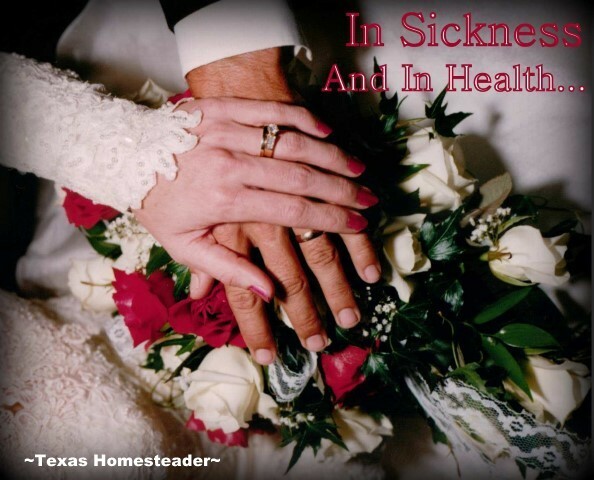 This entry was posted in Blog Posts and tagged Inspirational, Ranch Life on October 13, 2013 by Texas Homesteader. This inspiring story just got featured at http://mumtopia.blogspot.co.uk/2013/10/the-creative-home-and-garden-hop-15.html. Thank you so much for sharing it with us at the Creative Home and Garden hop. Best wishes to you and your hero, from England! Thanks so much for sharing at the Blog Hop Blitz, where we’ve crowned you as one of our Most Valuable Bloggers! What a wonderful partner you have and such a beautiful post. I am so glad you are looking forward to better days! Thank you for sharing. We are not married but pray one day to have a marriage strong and abiding like this. Blessings. What a beautiful photo of the two of you out by the water. You can feel the love between the town of you just in the way you look at each other. Great post! Many people merely recite those words “in sickness and in health”, but you guys surely are walking them out! What an inspiration. What a inspiring story of true love. It does exist today just not as much as it should. I am so glad you beat the cancer and send my prayers. I have been married 25 years and it is the hard times that seem to make or break us. Glad you had RancherMan to help you through your ordeal. Sending my blessings. Visiting from Link Up Tuesday! God Blessed you both for you have found something most people search a life time for! May God continue to bless you!